I have in my jacket pocket two smooth stones – river pebbles, worn by years of exposure first to running water, and then to wind, snow, rain and sun. When I picked them up they were still so warm from the late autumn Saskatchewan sun that I could put my hand in my pocket and feel the warmth lingering there. The stones come from the foot of the first concrete marker in the North West Mounted Police Trail. It was at the Wood Mountain historical site, site of the Wood Mountain trading post, and of the original boundary survey camp. It’s a three-hour drive south and east of Regina, on increasingly small roads, where I met local historian and NWMPT curator Hugh Henry. Technically, the young, untested recruits from Ontario started further east. In their second-hand gear and with their quick training , they were so poorly-equipped for the harsh environment facing them that by the time they reached Wood Mountain they’d already see a number of their horses die and had been beaten down by storm, swamp, and pest. Jim Daschuk, author of Clearing the Plains, told me how the SK First Nations still recount how the NWMP recruits contracted lice and fleas so badly that they had to teach them how to take off their clothes and put them onto ant hills where the ants could eat the lice and thus relieve the young military force. The thought of the future red-coated pride of Canada buck-naked on the open prairie on their first expedition west to “save” the Indians says a lot about how our history needs to be revisited. 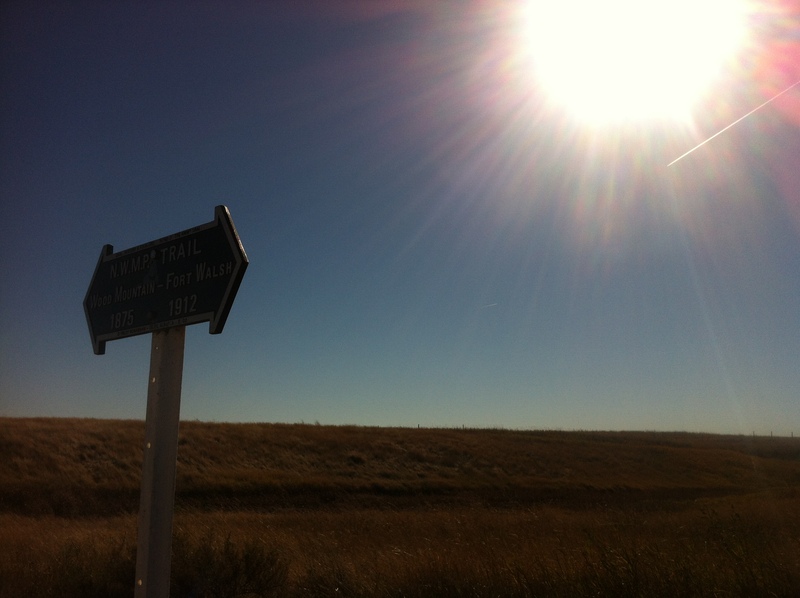 Between Hugh Henry, Jim Daschuk, Kathy Grant, Brenda Peterson and others I learned a lot about the NWMP trail this visit. I’m hoping that some of us will walk the trail in the next year or two, not just to commemorate the brave and young Ontario men who came west, but also the Metis, and First Nations peoples who were there already to meet them, who had walked the trail, and who would soon be pushed off the very land they then called their own.